Piano Score (PDF) for, you know, your piano player. Lead sheet (melody, lyrics, chords; PDF) for your music leaders and vocalists. Congregational line (TIF & JPG) to drop into your bulletin template. Two styles of guitar/bass charts (PDF) By the way, make all the copies you want. Powerpoint slides, ready to format with your colors and images. Leader’s notes (PDF) for leaders, so introducing the song goes well. 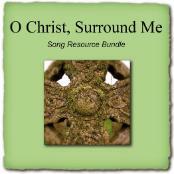 mp3 of "O Christ, Surround Me" from the Worldmaking CD/songbook collection. 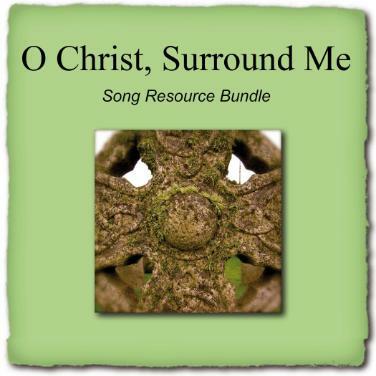 PLUS an instrumental accompaniment track, perfect for practice or liturgical karaoke. Thanks to all who helped inspire this song and the resource materials. All materials are delivered via download. A license is required. If you are licensed via OneLicense or CCLI, you're already covered. If not, a simple Worldmaking.net license is included. Thanks.